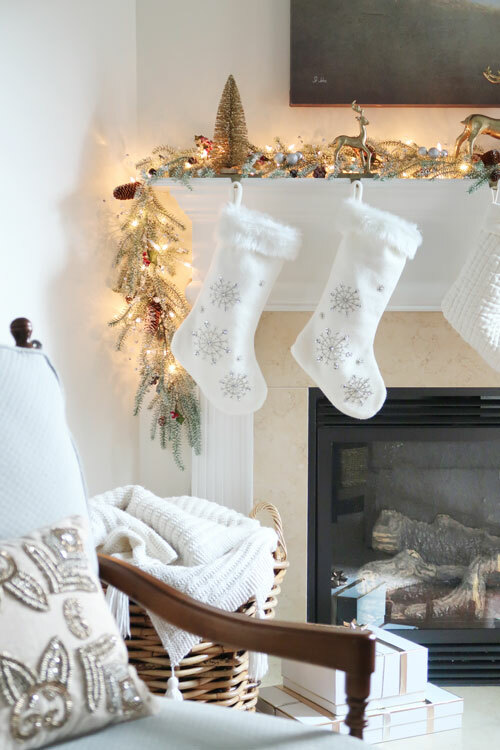 Do you have a narrow or simple fireplace mantel and looking for Christmas decorating ideas? 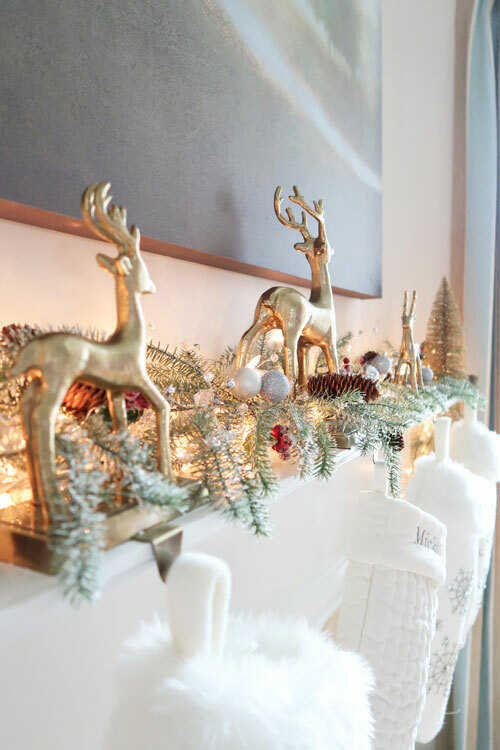 Here is how I decorated my narrow mantel using lots of sparkle! For about 8 years, I decorated my mantel for Christmas the same way and boy was it easy and fast! As a matter of fact, I wrote a whole post about it because it only took 30 minutes to assemble each year. This year I decided it was time for a change, but decorating my mantel at Christmas time is a challenge. It is REALLY narrow, so the design needed to be simple. 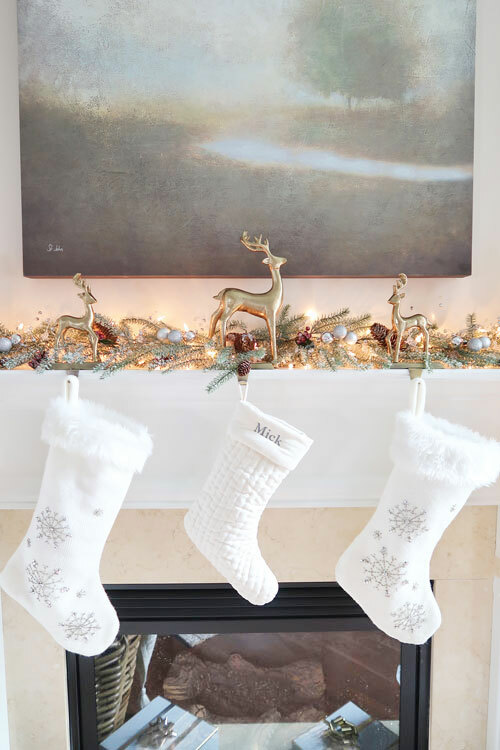 Read on to see how I tackled the mantel this year! Yes, my new Christmas mantel started with finding pretty things in the front bins at Target. You have to love the Christmas dollar items right when you walk into the store. Decorating your mantel does NOT have to be expensive! Black Friday is the best time to buy too, with most things at Michael’s and Hobby Lobby 50% off. 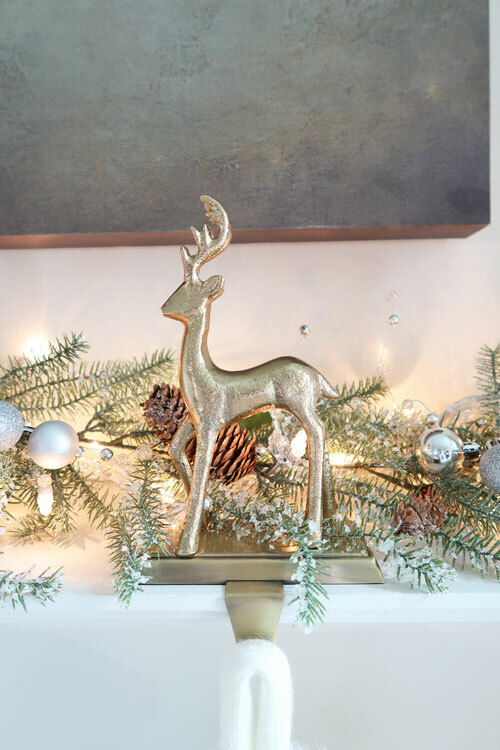 First, I found gorgeous brass reindeer that I had to have (didn’t know they would end up on my mantel) and then some gold bottle brush trees. These items were the simple base I started with this year – easy right! Starting a design with things you love to look at is always a good idea. I knew those reindeer and little trees would make me smile. Plus dig through your Christmas decor BEFORE you go shopping and reuse things you already have. Here are the hot sales happening now that I’ve been shopping! If you missed it, I have ALL kinds of affordable Christmas decor with curated collections of frosted greens, glass trees, reindeer, and pillows. Do you like that theme? I came up with it just now ha, ha! Honestly, at night when I stare at the mantel all lit up that’s what I think. Like a little fairy could be playing with the reindeer in the forest. What really makes the mantel look magical is all the crystal on the lights and also on the garland. I have to confess that the iced garland created a HUGE clean up job, but once up it’s so gorgeous it was worth the trouble. To make sure everything stayed secure, I used Command Adhesive Clear Outdoor Light Clips to hold the lights. 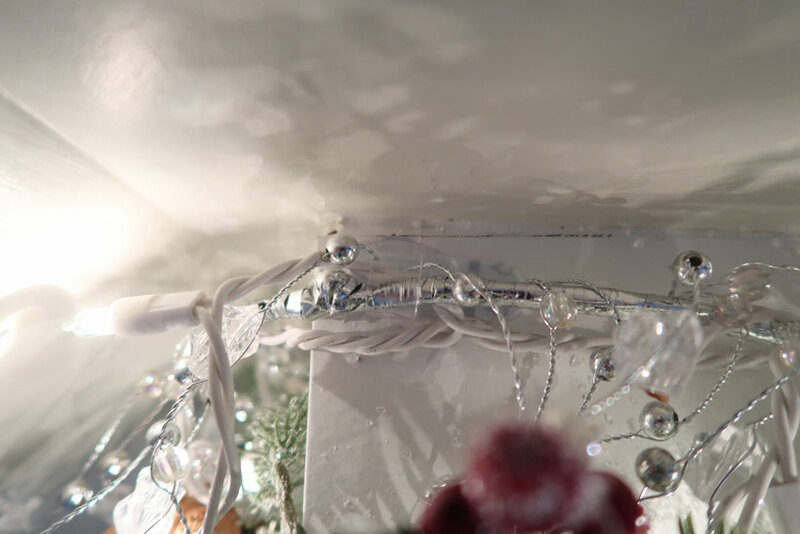 Then, I wove the crystal beads and lights through the garland. When I take it down, I’ll keep it as one unit so it’s easier to put up next year! Using flat stocking holders gave a platform to place other things, plus they are then hidden from view and the garland covers them. I really like these as a solution to be able to use as much space as possible for Christmas decorations. 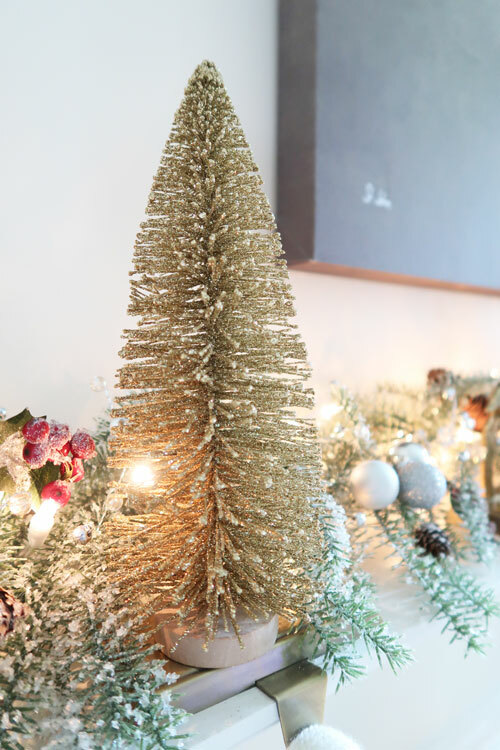 Bottle brush trees are the most inexpensive way to add charm to your Christmas mantel. These I found at Target in the Dollar spot! The stocking holders are surprisingly sturdy and hold steady even when the stockings are full. To cover up the holders and soften the edges of the mantel itself, I pulled the garland in between the legs of the reindeer and around the bottle brush trees. 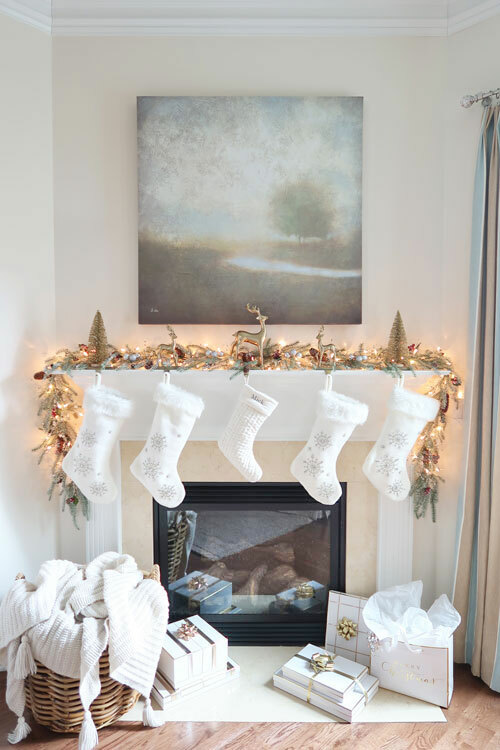 Then, to fill out under the mantel and make it really inviting are a basket filled with warm blankets and beautifully wrapped gifts. Don’t you just want to sit here by the fire and get cozy! This is my mom’s and son’s favorite spot to watch TV. Last but not least, are these beautiful stockings! I love the silver beaded snowflakes and the fur cuff. Plus Mick the Maltese gets his own version hanging from the largest reindeer! Guess how they are hanging straight and look full? Just a little packing paper leftover from some Home Goods purchases. Easy trick right? 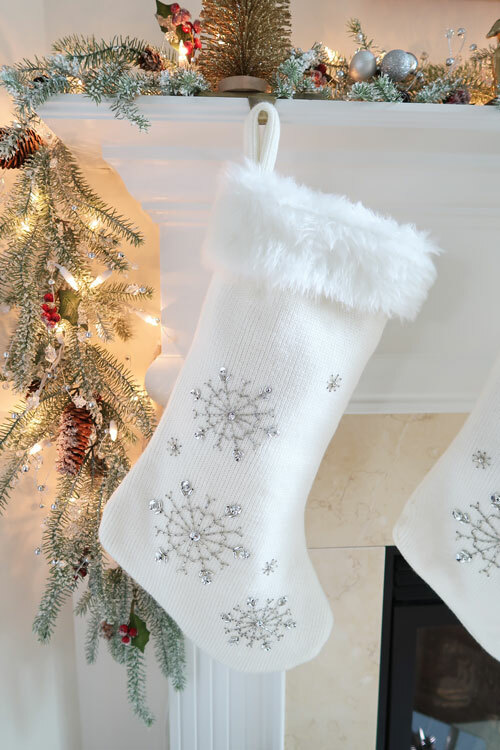 Unfortunately, the snowflake stockings are no longer available, so I’ll share some that are very similar. The monogrammed stocking is the best and still available! Plus here I’m linking the stocking holder too. See just a few elements even on the smallest of mantels can be magical! I love the look at night how the crystals on the garland and light strand reflect the light. SO pretty! Hopefully, I’ve inspired new ideas and showed you how to create a beautiful mantel that will fit in any decor. 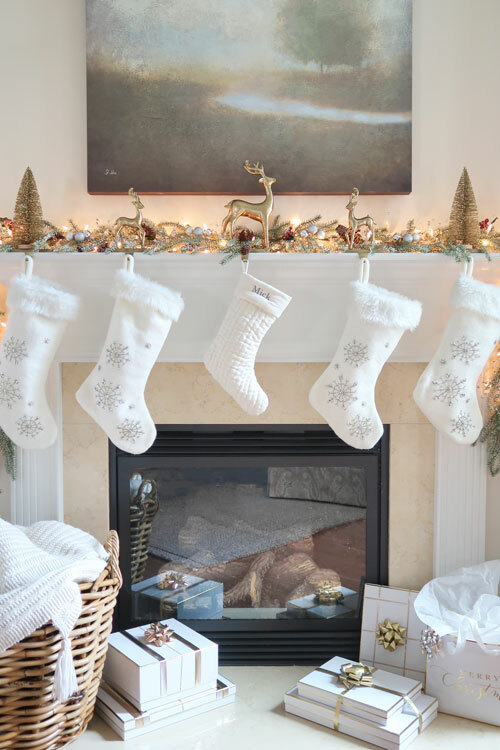 Good luck with your own Christmas mantel creation! 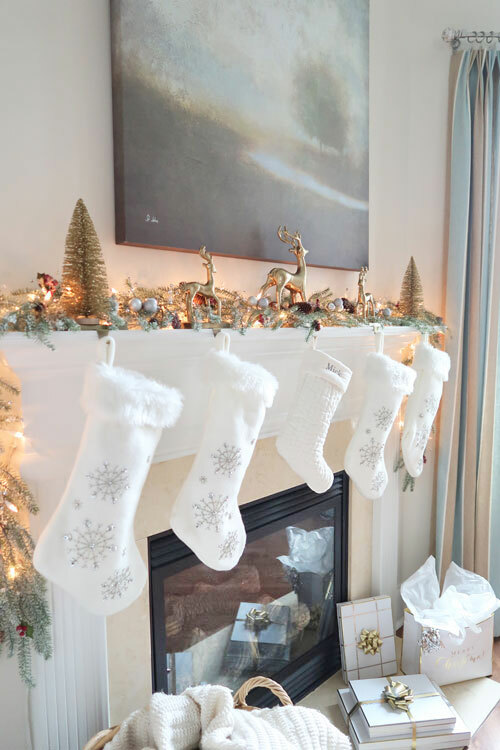 Coming soon I’ll be sharing all of my Christmas decorations in a home tour! Please consider signing up for my weekly email, so you never miss a post or something that may inspire you. « Kitchen Cabinets Chipped or Baseboards Peeling? Here’s What to Do!